Wales coach Warren Gatland has admitted his side were not "emotionally" ready for their third-place play-off clash against Australia and bemoaned kicking failures which cost his side en route to a 21-18 bronze medal defeat. Wales could not deliver a similar performance to which they have become synonymous for during the World Cup, falling just short in their bid to claim third place. Effort was not in short supply but the heartbreaking semi-final defeat to France appeared to take its toll, with Gatland revealing the squad struggled to raise their intensity. He said: "Probably the learning that we took from tonight is that we weren't quite as emotionally up for it as we have been for other games. I think that showed. "Our performance was probably a little bit down on what we're capable of. In saying that we've played ne of the tops ides in the world and posted a very close score and scored two tries against them. "They've been one of the best defensive teams in this competition and only conceded four tries in their pool, didn't concede a try against South Africa and the All Blacks only scored one try against them. So we're disappointed, but we've got to take a lot of positives from this tournament and how well we've done and the way we've progressed as a team." Missed kicks cost Wales yet again as Hook failed to hit the target with a conversion and penalty during Friday's encounter. Throughout the tournament, despite their exciting brand of rugby, failures with the boot have left their mark on Wales - against France Hook missed two penalties and a drop-goal attempt, while veteran Stephen Jones could not convert with a match-winning conversion and drop-goal attempt. They were lauded for their bravery in defeat against Pool D rivals South Africa but, had Rhys Priestland or Hook took the points on offer with their respective chances, then Wales would have been on the right side of the result. 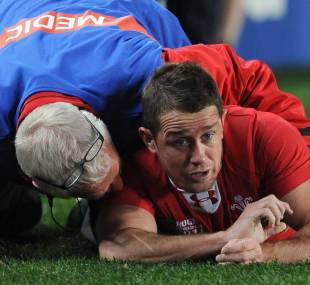 "Probably the person upset is Neil Jenkins [Wales kicking specialist]," Gatland said. "The kicking's been an area of strength in the past. But for whatever reason we've missed some in critical moments here and it's cost us. At this level you have to take your opportunities. Unfortunately on these big occasions our goal kicking has let us down. "If we look at the past those kickers who have been taking goals have been in the 80s [percent]. James missed one almost in front of the posts. It's pretty important in the scheme of things and it's probably what cost us." Stephen Jones said: "We've lost three games so closely. One of the easiest things to look at then is goalkicking. I would be interested to look at our statistics compared to other teams. "We thoroughly enjoy working with Neil. He challenges us and he wants us to be the best out there. We set ourselves high standards, and it is frustrating when it doesn't go our way. We do put a lot of hours and effort into our kicking game, and it's important that we do because it decides matches." Wales' stand-in captain Gethin Jenkins was bitterly disappointed not to bow out of the tournament on a high but was proud of the team's achievements in New Zealand. He said: "I'm proud of the way we finished, we've just come up short again today, but we've enjoyed the tournament. It's a shame we couldn't finish it off with the win." "We know how good Australia are, and they competed well. We tried to play a little too much rugby and it cost us with turnovers and the tries they scored. But we kept working to the end. "To get to the semis is a great achievement for this group of players. We talked about creating history and to come fourth, while it's not as good as third, is still an improvement on the last couple of World Cups." Wallabies coach Robbie Deans admitted it was hard to lift his troops after the semi-final defeat to New Zealand but said he was proud of their efforts. He said: "I'm very proud of the lads, they had to work hard. There were lots of distractions but they stuck to it. It's a short turn around and it's not easy because the blokes are pretty disappointed. "Having said that, it is still an opportunity to represent your country and I think you saw that in both sides tonight. Both sides took to the contest with a lot of pride and I think that was evident in the way both sides defended. It was pretty tiring, we had a high attrition rate, but the boys showed what it meant to them by the way they stuck to their task. "That's the nature of the World Cup, it's the ultimate event, there's a lot of pride in that, the adrenaline pumps and players are totally committed."